This artist’s newspaper is composed of articles, texts and images that have grown from a dialogue between the artist Melanie Jackson and the writer Esther Leslie. It takes Goethe's notion of the Urpflanze as a starting point: an idea of plant form that had all future plants coiled up inside it. The Ur-form or Ur-phenomenon, is an effort to think through the relations between polar opposites, form and metamorphosis, nature and history, simultaneity and succession. The Urpflanze projects forward from its origins whole worlds that are yet to come. The publication is supplied in a limited edition of 100 in a screenprinted archival box also containing a unique offset litho 'make ready' print version signed by the artist. Melanie Jackson (b. Hollywood, West Midlands) lives and works in London. She studied at the Byam Shaw School of Art and at the Royal College of Art, London, and is a lecturer at the Slade School of Fine Art, UCL. Jackson continues an ongoing investigation into mutability and transformation. Drawing on the intimacies of knowledge at the nanoscale to the spectre of gargantuan monstrosities, there is an intrigue in the primordial to the yet-to-be-created. The ways that objects influence, socialise, or empower us – or render us insubstantial, are pursued to kaleidoscopic affect through sculpture, comic book sequences and moving image works. Melanie Jackson collaborates with writer Esther Leslie. 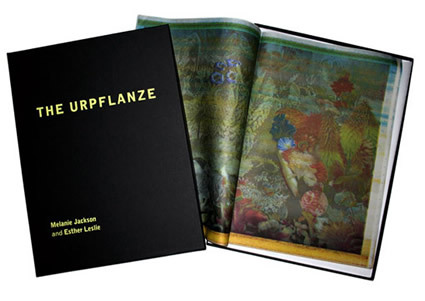 They have produced two publications The Urpflanze and The Ur-phenomenon and they are commonly pursuing liquidity; currently in the form of milk and clay. She was shortlisted for the Maxmara/Whitechapel award in 2009 and won the Jerwood Drawing Prize in 2007. Selected solo exhibitions include: The Urpflanze (Part 2), Flat time House, London (2013), The Urpflanze (Part 1), The Drawing Room, London (2010), Road Angel, Arnolfini, Bristol (2007), Made In China, Matt's Gallery, London (2005). She is represented by Matt's Gallery, London.